The BMW 3 Series went on on sale from 9 March 2019 with diesel prices starting from £33,610 for the 320d. The 318d, priced at £32,450, joins the range in April. The 3 Series Saloon has been in production for more than 40 years and this is the seventh generation model to go on sale. 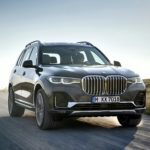 BMW starts production of another Sports Activity Vehicle with plug-in hybrid drive at the end of this year, thereby further expanding its range of electrically powered vehicles. BMW is no stranger to producing stonkingly great executive cars, and the F10 5-Series is the culmination of all the lessons the German firm has learnt. From its engines and chassis, to interior quality and its iDrive infotainment system, everything feels honed to make the driving experience first rate. The popularity of saloon cars might have waned, but the demand for executive models like the 3 Series remains buoyant. For motorists who need space and performance, there’s nothing to replace the allure of a rear-wheel drive BMW with perfect weight distribution. BMW has announced a new 8 Series Coupé. The new car features BMW’s xDrive intelligent all-wheel-drive system and EfficientLightweight design measures. The company says the new car was developed alongside the BMW M8 GTE – a race car that has already proven its potential in the FIA World Endurance Championship (WEC) long-distance races and in the IMSA WeatherTech SportsCar Championship (IWSC) held in North America. The new BMW 330e plug-in hybrid saloon is due to be launched in summer 2019. It delivers a 50 per cent increase in electric-only range to go with a reduction in CO2 emissions of more than 10 per cent.